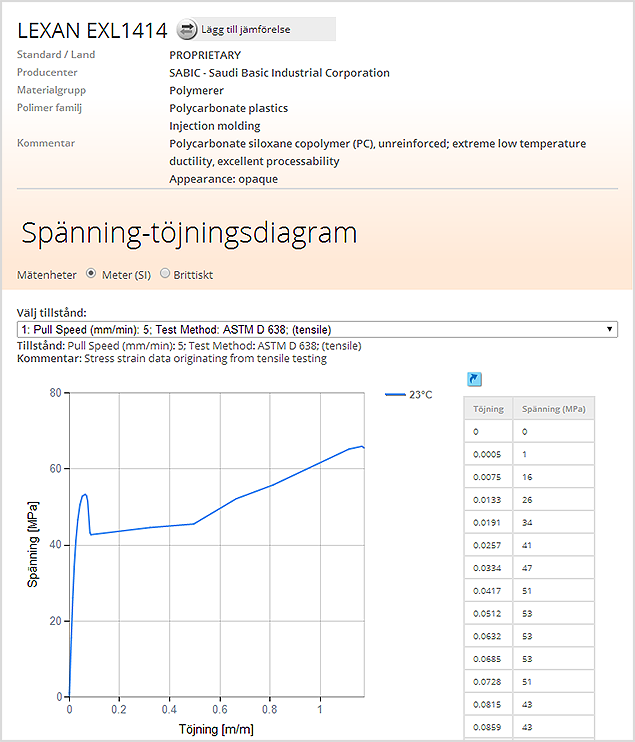 DataPLUS är en kompletterande datamodul som ger korrosionsdata, materialkopplingsinformation, materiella dimensioner och toleranser och beläggningsinformation för tusentals av metalliska och icke-metalliska material. Klicka här för att se ett exempel. Total Materia har tillåtit oss på ett snabbt och effektivt sätt lösa alla problem vi hade för sökningen av alternativa material i utlandet. Tack vare Total Materia har vi numera satt upp riktiga "internationella" specifikationer för att köpa stål i utlandet. Total Materia är det enda verktyg som kommer användas för detta. PolyPLUS is the non-metallic material properties dataset for thousands of plastics, ceramics and composites covering both proprietary and standard materials and including advanced property datasets. In Total Materia's library of Polymer materials it is possible to find tens of thousands of plastic materials covering polyamides, rubbers, vinyls resins and many many more. To begin searching and if you know the material designation you are looking for you can simply enter this into the material designation box on the PolyPLUS quick search page. Other search possibilities available allow you to also search by country/standard, producer, group of materials and material family or to search by properties in advanced search. In this case we will view information for the material LEXAN EXL1414. 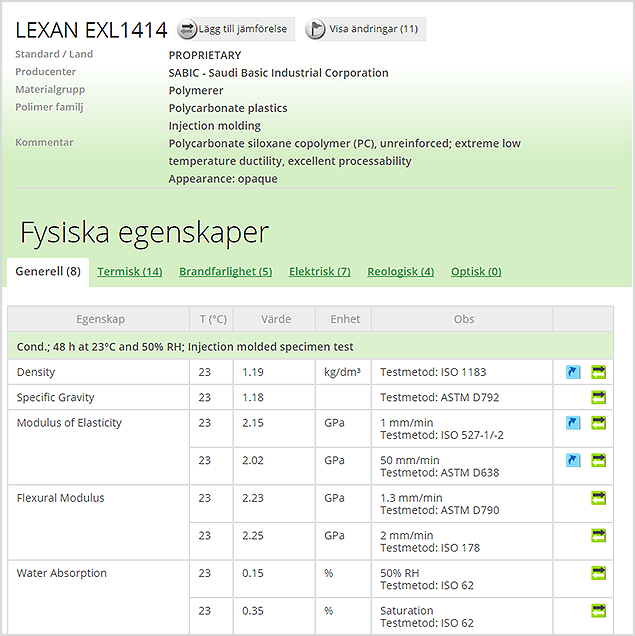 After you insert the material designation into the field, click on the Search button to generate a list of materials which match your search criteria. The list of materials will display all relevant materials matching your original search criteria. To view a summary of all available property information, click on the material of interest. All property catergories for which data can be found will be visible through the coloured link with the number of data points available given in brackets as well as the producer of the material where applicable. To begin viewing material properties, simply click on the link. In this case we will first take a look at mechanical properties including flexural strength, tensile strength, tensile strain and much more. Physical properties cover, to name but a few, density, modulus of elasticity, flexural modulus with additional catergories also available under the tabs rheological and optical properties. Through seamless integration it is possible to view Extended Range data for plastic materials directly from the PolyPLUS module. Stress-strain and fatigue data of use for advanced non-linear calculations can be found by clicking on the orange links. For more information on how to navigate through the Extended Range module see our guided tours for viewing stress-strain diagrams and viewing fatigue data. Viewing cross references and making material comparisons is a critical part of material replacement and selection. To view cross reference tables for plastic materials simply click on the cross reference link. Here you will be presented with a categorized list of equivalent materials from which you can look in more details at property data or select to compare along side your original material. For more information on cross referencing in Total Materia, see a more in depth tour in our Total Metals guided tour library. 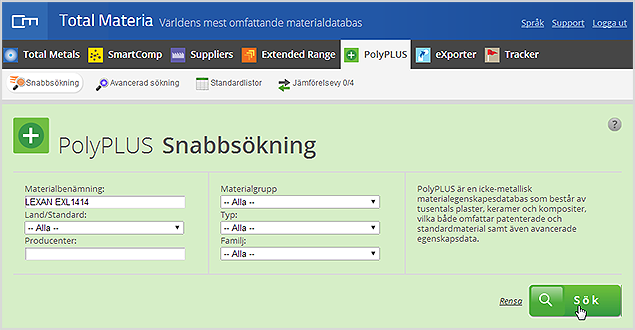 There are two ways to compare materials in PolyPLUS, through the quick compare option which allows a quick side by side view of the two materials of interest and also through the more comprehensive comparison view option which allows for up to 4 materials and their properties to be compared simultaneously. For a more detailed look at comparison possibilities in Total Materia see our Total Metals guided tour library for more information. © 2019 Key to Metals AG. Med ensamrätt.